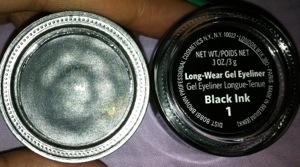 I have been using Mac’s gel eyeliner in blacktrack for years. I tried the maybelline gel eyeliner and didn’t find it suitable for my sensitive eyes. So I had to stick to blacktrack if I wanted to put it in the waterline. 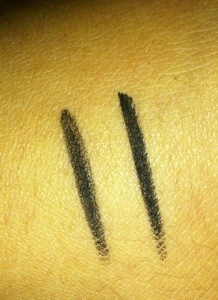 Recently, I thought about restocking with Bobbi brown’s gel eyeliner instead. It was more expensive at $40 vs MAC’s $30 odd or maybelline at $15. 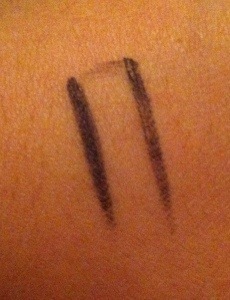 The line on the right is mac blacktrack and left is Bobbi brown black ink. As you can see, the difference in colour is pretty obvious. I personally prefer each one for different looks. 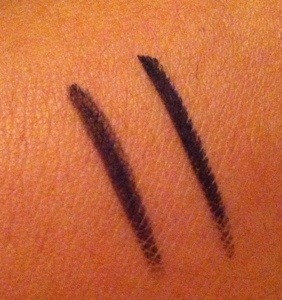 When I am wearing dark eyeshadows and need an eyeliner that stands out from all that darkness, I will pick Mac. 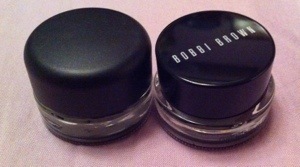 For day to day use with neutral or soft colours, Bobbi seems to be more appropriate since the colour isn’t harsh. The bottles are of the same size and weight 3 grams each. They come in a glass bottle which Must be tightened properly after each use. They are less than $10 apart. Since the bottles are glass, you will need to be extremely careful with handling them. MAC’s description has worn off after many months of using it.